Does a condition need to be built for every possible combination? Does a condition need to be built for every possible combination of options? I have 2 drop down menus, but only a couple conditions need to route an email to a different department. Do I have to build every possible combination? If email is involved in any conditional statement, it will be only sent if associated condition is met. If you have just few cases when recipient must be changed, you should create conditions for that. Also, in order to send email if those conditions are not met, you would need 1 more statement, which checks if other conditions are not met. 1. First condition checks if dropdown field is equal to some value and sends an email. 2. 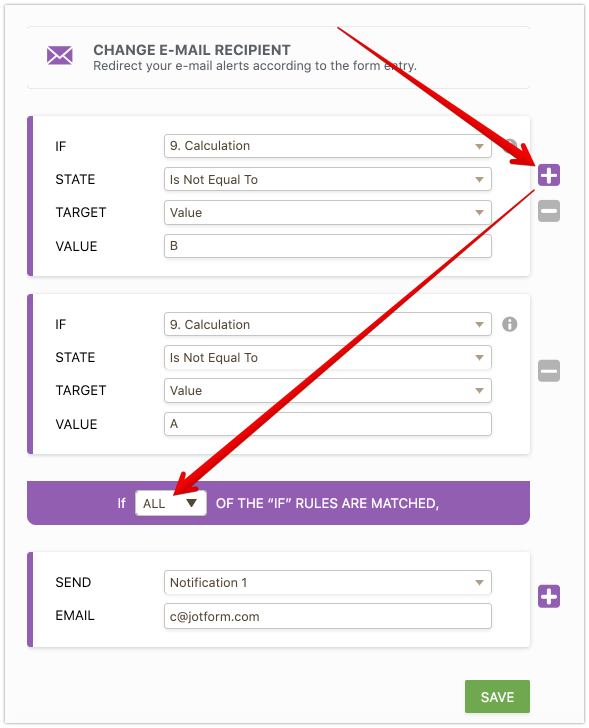 Second condition checks if another dropdown field is equal to some value and sends an email to other recipient. 3. Third condition should check if dropdown #1 is not equal to the value plus second dropdown is not equal to the value and send email. We will gladly take a look at your form if you can share the link. So, if I forget to build a condition for one of the combinations (there are 2 fields with 3 options each), should an email notification go out to the address listed in the "default" notification? I tested this and it didn't. It appears that if I build 1 condition, I must build all possible conditions otherwise and email will not be sent out. Hello Adam, If there is at least 1 condition applied to email notifier/autoresponder, that email will not be sent to default recipient if condition is not met. You would need to create 1 statement for alternative case. A statement should check if other conditions are not met and send an email then. If you need help with specific form, we will gladly take a look, just let us know its link.